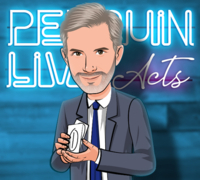 Today, when you order "Anthony Owen LIVE ACT", you'll instantly be emailed a Penguin Magic gift certificate. You can spend it on anything you like at Penguin, just like cash. Just complete your order as normal, and within seconds you'll get an email with your gift certificate. 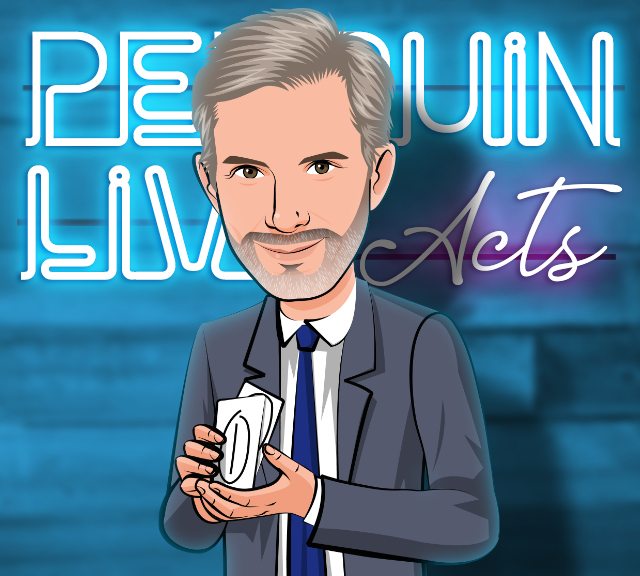 Anthony Owen LIVE ACT (Penguin LIVE) SUPPORT LIVE MAGIC. START LEARNING THE FULL ACT TODAY. (About his book SECRETS) "A book of reputation makers from the man responsible for some of magic’s greatest reputations. "- Piff the Magic Dragon, Las Vegas headliner. This act will play for 15+ mins. It can easily fit into a small carry-on flight case and yet contains four incredibly powerful perfomance pieces. This is the act which has taken Anthony aound the world from London to Las Vegas and has amazed, shocked and entertained audiences every time. Now - if you listen carefully to the information he shares - you can do the same. Items from this act are being perfomed every night in the working repertoires of leading professional magicians around the world. These are not pipe-dreams. These are professional performance pieces. While you'll see them performed in a stand-up platform environment some of this material will also work perfectly in a close-up intimate environment too. Anthony will clearly explain how to adjust the material to make it work for you all in situations. Natural Lottery 2018- This is Anthony’s ultimate version, with a new gimmick design and handling which has been improved further since its acclaimed publication in his book SECRETS. This particular version has never been taught before in video format. Number at Card- Anthony’s classic version of the Card at Number effect. Acclaimed by many as one of his greatest creations. For Penguin Magic he will be explaining further thoughts and improvements on video for the first time ever. America’s Next Top Magician- A fun interactive mentalism routine involving the entire audience. First time explained on video. Psycho Quiz Prediction- A killer routine in which you predict in advance the answers a specator will give to a magazine psychological test. Anthony will also be revealing additional bonus ideas about this effect which he has never revealed on video before. Anthony Owen is recognised by his peers as one of the world's most creative magicians. He is a past winner of the David Berglas Award. He has worked behind the scenes as a creative consultant and / or Executive Producer for many of the world's top magicians, including Derren Brown, Penn and Teller and Dynamo. He is particularly known for his work in the field of mentalism and it is this which he will be sharing in this special Penguin project. Past winner of the David Berglas Award from the British Magical Society. Also awards from The Magic Circle in London, including Member of The Inner Magic Circle with Gold Star. Winner of multiple awards (BAFTAs, Rose D’or, Royal Television Society, National Reality Television Award) for his work as Creator and Executive Producer of UK television magic shows and specials. 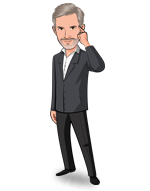 Author of over twenty books on magic, including the recently published 'Anthony Owen's SECRETS' which has been acclaimed with five star reviews from magazines, websites and magic blogs around the world. Where can you see the greatest creators and performers share their professional magic act in front of a live audience and then teach you to do it? Only Penguin LIVE: ACTS! The world's best magicians spend years developing the perfect act. Magic fans almost never get a chance to learn the real secrets behind what makes the top pros act so amazing. Until now. Penguin Live Acts gives you exclusive access to the biggest names in the industry, as they share how to perform their powerful A-material. First you'll get to watch the show, performed for a real audience, from start to finish. Then you'll go behind the scenes to learn about the routines, and the real secrets about building an act that can take decades to learn. Many of the ideas shared have been held back for years, and you can only learn it at Penguin LIVE: ACTS! Want VIP access to EVERY FUTURE Penguin LIVE we film? Check out Penguin LIVE: All Access Pass! Purchase this product and on September 30th anytime after 12:00pm Eastern, click the MyPenguinMagic area at the top of the Penguin site. You'll see the "learn" button appear next to this lecture. This product is for everyone, from the beginner to the professional and for magicians and mentalists alike. Don't miss it! Was anxiously awaiting this one. Unfortunately, it was a big let down. The act was very short. 4 tricks. Under 15 min. Not a problem if the material was killer. Unfortunately, it was not. Lotto trick was the best. His original mechanical method. Good if you don’t want to give away the ticket. His card at any number was odd. Didn’t work in the live performance. He did it a different way in the explanation. Not sure why he didn’t do it that way in performance. Regardless, there are much better versions. The third routine was pretty much a throwaway. Basically a 1 in 5 prediction. Worked but seemed like it was thrown in just to fill time. Final routine was a magazine test. Better than the third routine but again, there are better and more entertaining versions. 23 of 25 magicians found this helpful. 4 prediction effects. I like interaction, games and quizzes, so I hoped for new and fresh ideas. Unfortunatly neither the ideas were new or fresh, nor the principles or the solutions were new or original. Most of the ideas were ideas I had by myself years ago but never done because I didn´t think they were good enough for a paying audience - now I paid for myself and I was right. Old and medicore principles like the f+++bag not well layered are not the stuff I would present anymore in 2018. If you took a closer look at Marc Paul or Jan Forster you can see real solid material worth the price. For me, this lecture was a big disappointment ...again. 7 of 9 magicians found this helpful. Anthony Owen is not a new name to me being in the U.K. I have already read quite a collection of his effects and takes on plots in magic. I highly recommend buying his new book Anthony Owen’s Secrets by VanishingInc. The reason being not only will you learn and understand Anthony’s methods and effects and plot ideas it will help you to improve and give further suggestions mentioned in this Act lecture. There are only 4 effects taught and performed but it is the thinking and the HOW and the WHY that you are paying for here. Anthony opens with The Natural Lottery and discussed WHY he came to use it as an opening effect. HOW he adapted the methods that he uses and the thinking and reasoning for doing so. He then went on to Number at Card, his version of the ACAAN, to me this is not the version I would perform or use. But it does show you how he has made this into a stand up stage performance piece. His next performance piece was Big Survivor 2, here he used America’s got Talent plot line to perform a who will win the best magician for Las Vegas. His last effect is a marketed trick Psyco Quiz Prediction, again not only showing HOW to make it play big on stage but also the WHY he uses it and why he does it the way he performs it. You will notice and hopefully appreciate that in my titles I have used the ones from the book mentioned above. This will help you to read and adapt these effects to your own style and performance. The main theme running through this Act Lecture was how to adapt and routine these tricks to your own style and influence. I must also mention that Anthony explained pocket management, this act packs small and plays big. Dan Harlan was the perfect host and it was good to see and here how several variations and ideas were brainstormed in the explanation part. Please note that I am not advocating that you should perform this act has is, not that you couldn’t if you wanted to. I would recommend that you use the blueprints to put together a stand up Mentalism act using one or two ideas from this act. The 4 ideas presented can be easily taken and twisted to fit your own style by any creative magician. The effects are far more than the sum of there parts and are something working magicians will love. Also great for those new to magic. 4 of 7 magicians found this helpful. I have been a fan of Anthony's work for many years and have always found him to be a great source of thoughtful, elegant, and clever ideas. This lecture was also excellent and the confabulation routine alone is of remarkable value to the working mentalist. Anthony's well-thought-out method allows us to create one of my favorite miracles without some of the logistic and technical pitfalls of other methods, perfect for those of us who want something both incredible and practical! It is no wonder that this man has the awards and accomplishments that he does. This lecture, as well as his recent book Anthony Owen's Secrets, is a small but valuable investment for any lifelong student of mentalism. I'm with the other reviewers who felt the act was too short and not all that entertaining. There are some good principles here, obviously. But compared to the other Live Acts — which are full, complete acts with beginnings, middles, and ends — this was falls way short. Very Practical and effective material. Well worth downloading and learning. Save your money and buy something else. the effects shared are not impressive. Good... but I don't "buy" the Lottery trick. This makes for a great accompaniment to Anthonys also excellent book, Secrets. Anthony shares his magical wisdom throughout, and its clear to see why he is one of the best minds in magic. 2 of 6 magicians found this helpful.